25 cm xxii, 554 p.
It outlines major writers, movements, and texts in the genre, established critical approaches and areas for future study. Fifty-six entries by a team of renowned international contributors are divided into four parts which look, in turn, at:history - an integrated chronological narrative of the genre's developmenttheory - detailed accounts of major theoretical approaches including feminism, Marxism, psychoanalysis, cultural studies, postcolonialism, posthumanism and utopian studiesissues and challenges - anticipates future directions for study in areas as diverse as science studies, music, design, environmentalism, ethics and alteritysubgenres - a prismatic view of the genre, tracing themes and developments within specific subgenres. 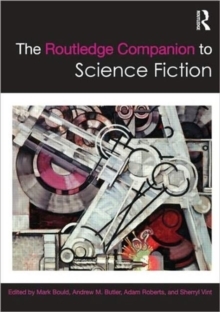 Bringing into dialogue the many perspectives on the genre The Routledge Companion to Science Fiction is essential reading for anyone interested in the history and the future of science fiction and the way it is taught and studied.